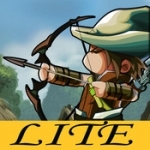 This game is adapted from legendary story of British hero Robin Hood. The game is 2D cartoon style including scenes: prisons, forests, castles and so on. There are 7 chapters which every is made up 4 stages, 28 stages total, through the game. There is a boss waiting for you in every chapter. Robin Hood becomes stronger after collecting crystals and gold coins to upgrade weapons and weapon skills and defeat enemies even bosses. The game play is simple and shows a variety of different fights, combat skills with magnificent effect. This is a lite version for users' feedback. If you have any advices plz mail us : service@dns.js.cn or our facebook. We will make the game better by your advices.Thanks! 개발사 : Suzhou Easy Information Co.,Ltd. 지원장치 : iPhone,iPod touch,iPad,iOS 3.2 이상 필요.